Emporia High School students Dacia Mast, junior, and Masa Vucinic, senior, competed in the Emporia Entrepreneurship Challenge Monday. EHS business teacher Amber Pankratz said both students students presented their ideas in “Shark Tank” fashion to members of the Emporia Masonic Lodge. 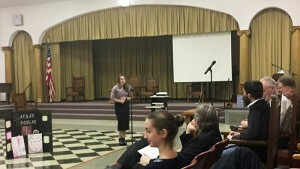 “Both did awesome presenting their ideas last night at the Masonic Lodge,” Pankratz said. Dacia Mast was selected to move on to compete in the Kansas Entrepreneurship Challenge April 17 in Manhattan, co-sponsored by Pankratz and the Emporia Masonic Lodge. The Kansas Entrepreneurship Challenge launched about four years ago and was a way for Kansas State University’s Center for Advancement of Entrepreneurship to reach throughout the state to affect the business environment. Teams of students compete in a high school or college division to pitch their business ideas and top winners in each category receive dollars to move their ideas forward, according to a joint news release from the Center and the Kansas Masonic Foundation. The 1st place winner of the Kansas Entrepreneurship Challenge will receive $10,000, 2nd place $5,000, 3rd place $2,500, and 4th place $1,500. All involved get the experience of doing this, networking with successful entrepreneurs and judges, exposure, feedback and support for their ideas. Initially just a competition for K-State students, a small local contest between students at Emporia State University and K-State led to growing the competition to include ESU and Fort Hays State University. Soon, the challenge to think creatively about business spread to all Board of Regents universities and some high schools, said Chad Jackson, K-State Center director. The winners divided $11,000, depending on their final slot, to support their business pitch. Then last year, the Kansas Entrepreneurship Challenge partnered with the Kansas Masonic Foundation and Kansas Masons across the state to “really grow the program,” Jackson said. Emporia businessmen Rich Avery and Steve Sauder.are among the judges for the state-level competition. For more information, visit ksechallenge.com.